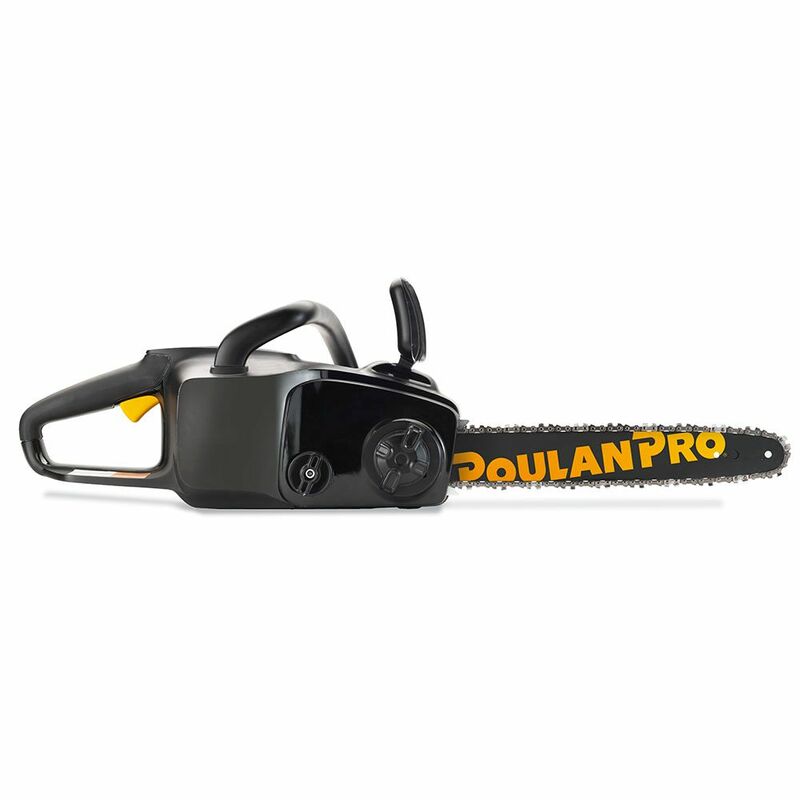 Powered by a 58V rechargeable lithium-ion battery, the all-new Poulan Pro PRCS16i battery-powered chainsaw delivers the power, performance, and runtime typical of traditional gas-powered tools, without the hassle of mixing and storing fuel. Featuring a brushless motor for efficiency, long life, and extended runtime; instant push-button starting; integrated power boost technology; built-in battery power meter so it's easy to monitor power usage; and a handle-mounted, easy-to-view battery power indicator; this quiet, convenient, ergonomically designed, and environmentally friendly chainsaw is easy to start and operate. It also features a substantial 16-inch bar and electronic chain brake with visual alert so user always knows when chain brake is activated. It's equipped with chain tension assist technology for intuitive indication of too loose or tight chains, and simple chain tensioning. This chainsaw has plenty of power for light-duty storm clean-up, trimming, and felling small trees. 58V Cordless Chainsaw 16inch, PRCS16i Powered by a 58V rechargeable lithium-ion battery, the all-new Poulan Pro PRCS16i battery-powered chainsaw delivers the power, performance, and runtime typical of traditional gas-powered tools, without the hassle of mixing and storing fuel. Featuring a brushless motor for efficiency, long life, and extended runtime; instant push-button starting; integrated power boost technology; built-in battery power meter so it's easy to monitor power usage; and a handle-mounted, easy-to-view battery power indicator; this quiet, convenient, ergonomically designed, and environmentally friendly chainsaw is easy to start and operate. It also features a substantial 16-inch bar and electronic chain brake with visual alert so user always knows when chain brake is activated. It's equipped with chain tension assist technology for intuitive indication of too loose or tight chains, and simple chain tensioning. This chainsaw has plenty of power for light-duty storm clean-up, trimming, and felling small trees. 58V Cordless Chainsaw 16inch, PRCS16i is rated 4.6 out of 5 by 7. Rated 4 out of 5 by Gma927 from Easy to handle As a female who had issues cranking a gas powered chainsaw, I decided to purchase a cordless product. The main reason for use is to trim around the property, and cut logs for the splitter, and so far this has done the job for me. It is easy to handle, and I like the features, especially the battery indicator, so I know how much usage time I have left. So far I am very pleased.